Colour defectiveness (also known as colour vision deficiency or CVD) occurs when you are unable to see colours in a normal way. Most commonly, colour defectiveness happens when someone cannot distinguish between certain colours, usually between greens and reds, and occasionally blues. Gaya Opticians are here to help you find out whether you are colour defective and to advise you. ,h2>Who does colour defectiveness affect? Colour defectiveness affects approximately 1 in 12 men (8%) and 1 in 200 women in the world. There are different causes of colour defectiveness. For the vast majority of people with deficient colour vision the condition is genetic. The gene which is responsible for the condition is carried on the X chromosome and this is the reason why many more men are affected than women. However, some people become colour defective as a result of other diseases such as diabetes and multiple sclerosis or they acquire the condition over time due to the aging process, medication etc. 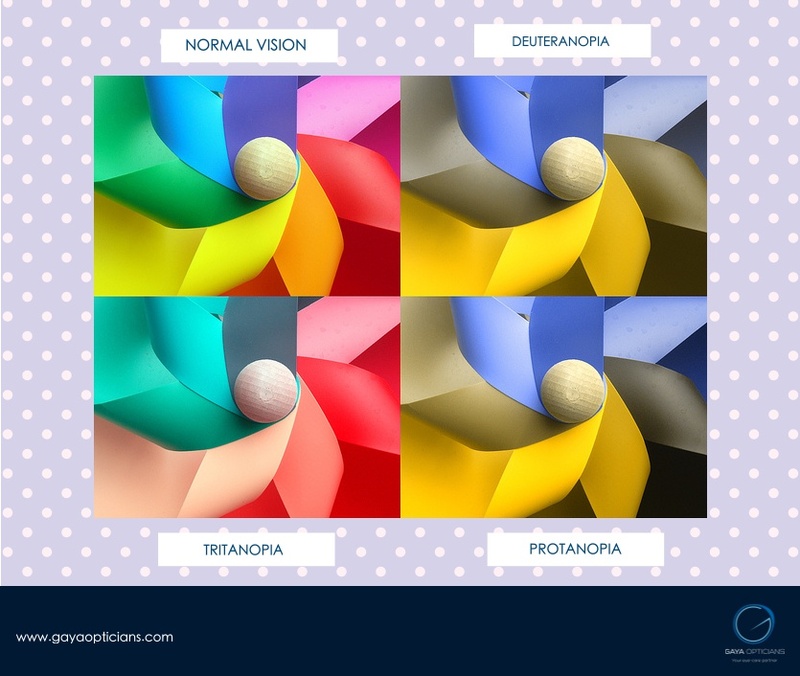 The effects of colour vision deficiency can be mild, moderate or severe depending upon the defect. If you have inherited colour defectiveness, your condition will stay the same throughout your life. It won’t get any better or worse. How colour defective people see the world? Most colour defective people are able to see things as clearly as other people but they unable to fully see red, green or blue light. There are different types of colour defectiveness and there are extremely rare cases where people are unable to see any colour at all. The most common form of colour defectiveness is known as red/green colour defectiveness and most colour defective people suffer from this. Although known as red/green colour defectiveness, this does not mean sufferers mix up red and green. It means they mix up all colours which have some red or green as part of the whole colour. For example, a red/green colour defective person will confuse a blue and a purple because they can’t ‘see’ the red element of the colour purple. See the example of pink, purple and blue pen cases below to understand this effect. Similar problems can arise across the whole colour spectrum affecting all reds, greens, oranges, browns, purples, pinks and greys. Even black can be confused as dark green or dark blue. The effects of colour vision deficiency can be mild, moderate or severe so, for example, approximately 40% of colour defective pupils currently leaving secondary school are unaware that they are colour defective whilst 60% of sufferers experience many problems in everyday life. Book an appointment with Gaya Opticians to determine whether you are colour defective and also to seek out our professional advices.